DT Research, designer and manufacturer of purpose-built computing solutions for vertical markets, recently announced the DT380CR and DT380Q rugged lightweight tablets, weighing two pounds and light enough for field workers to carry all day, yet with an 8-inch display that is large enough to facilitate a large number of indoor/outdoor computing assignments as well as provide high brightness with capacitive touch. 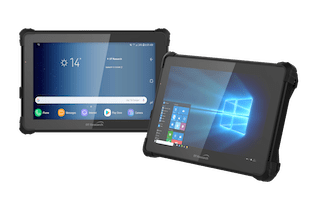 These new tablets have IP65 and MIL-STD-810G ratings for military-grade durability, seamless information capture-transmission capabilities and hot-swappable batteries result in no work interruptions– increasing productivity while simultaneously offering organizations an affordable rugged solution. A built-in 2D barcode scanner and 5 megapixel back camera or 3D built-in Intel® RealSense™ Depth camera make information and image capture and transfer easier. Robust wireless communications capabilities transfer information seamlessly through 4G LTE mobile broadband, WiFi and built-in long range (1,000 foot) Bluetooth. The new tablets are a high performance, yet low power consumption device, that run on energy efficient Intel® Atom™ Quad Core and Qualcomm processors. Customers may also order the tablets with built-in features for precision measuring and 3D image capture. Who are your customers for this rugged tablet?